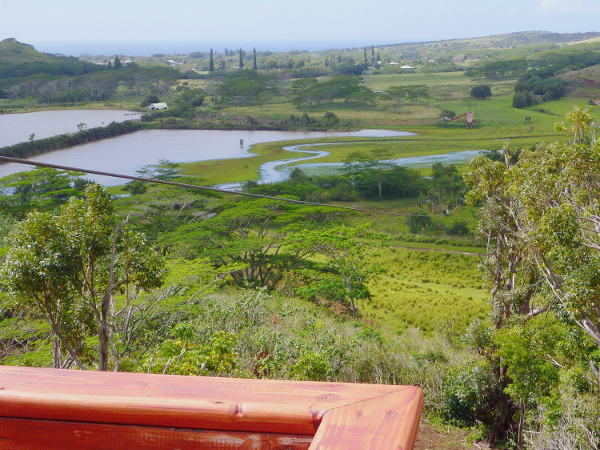 About the same time that we moved back to Kaua’i, some friends of ours moved back from the Big Island. 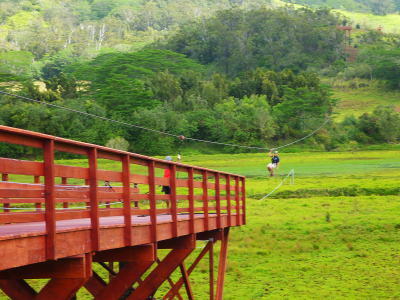 Derek had been working over there building a zipline course for his boss, and he was coming back to Kaua’i to build one for himself. So for the past two years, I’ve been hearing stories about him and his workers clearing the forest of 100′ trees, building platforms, stringing cables, and hiring guides. 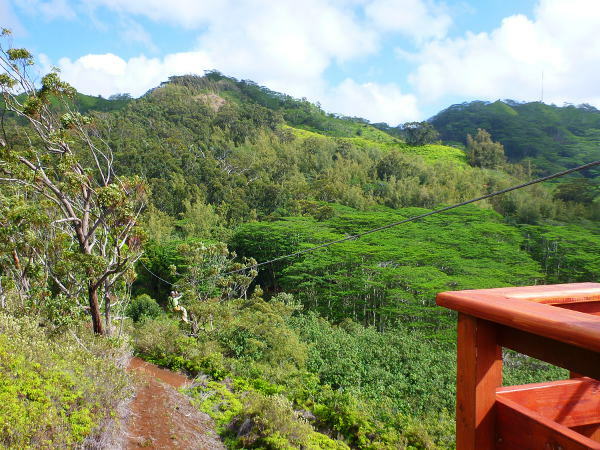 And last August, Koloa Zipline finally opened. 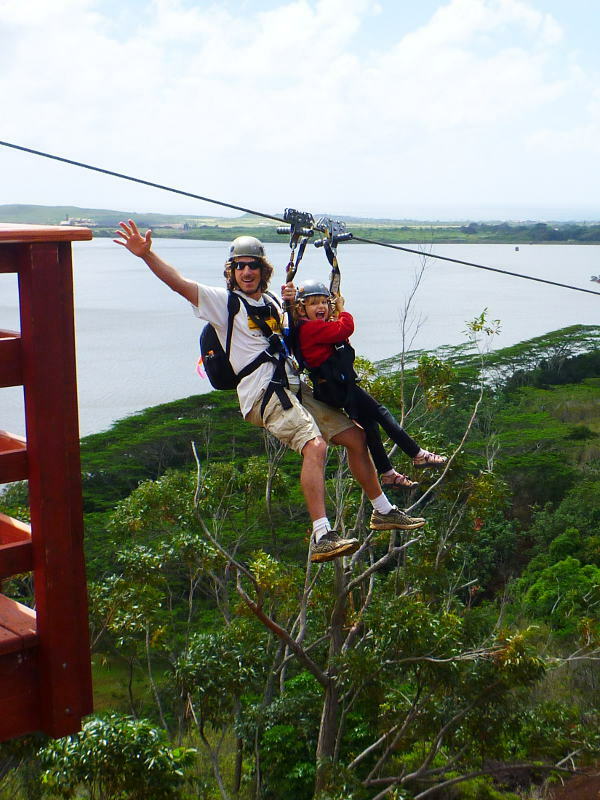 But my family and I had never actually been on a zipline before, so when he offered us a tour we said “yes, please.” I’ve been rock climbing and hanging on plenty of ropes (yeah, because I fall a lot), but my wife and daughter weren’t sure what to expect. They weren’t scared, just weren’t sure they’d enjoy the sensation. However, the guides were great and by the 3rd or 4th line, they loved it. 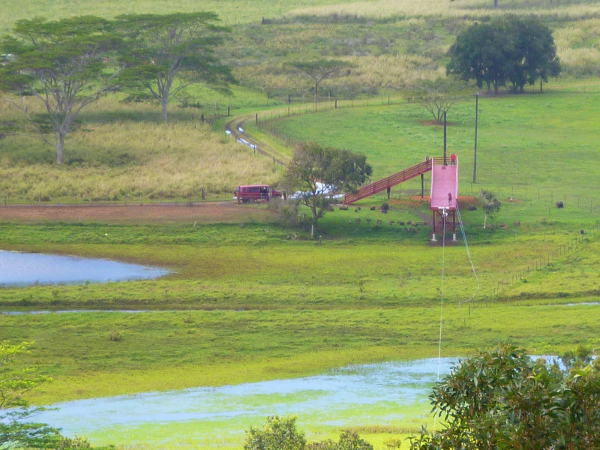 The day starts with a close-up of the Koloa sugar mill, where the zipline “baseyard” is. 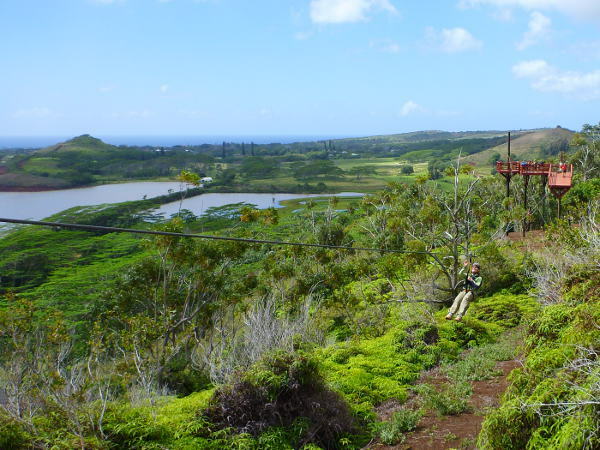 The zipline is partnered with Kauai ATV to run tours on the private Grove Farm land between Koloa town and the Ha’upu mountain ridge. 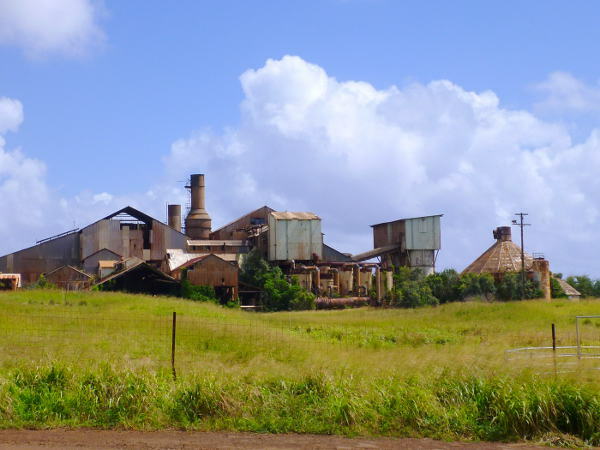 Since the Lihu’e and Kekaha sugar mills are being torn down, this is the second to last of Kaua’i’s now-closed mills, and the only one you can get close to. It’s actually very scenic, in a Mad Max sort of way (they still use it in movies). 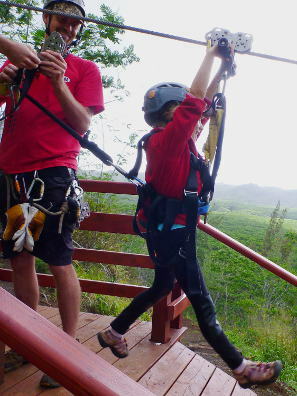 First, we all got fitted with harnesses and helmet, the same for kids as for adults. Both of them adjust to give a snug and safe fit. 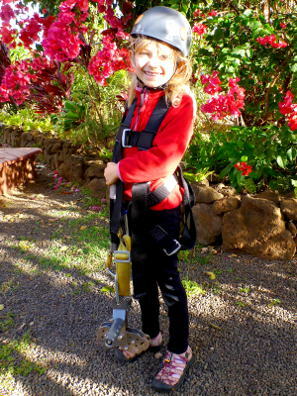 The harness includes the pulley that everyone has to carry around–this was the only thing that was a bit hard for my daughter, and I often helped her carry it (the 10 and 12 year-olds on the tour carried their own easily). 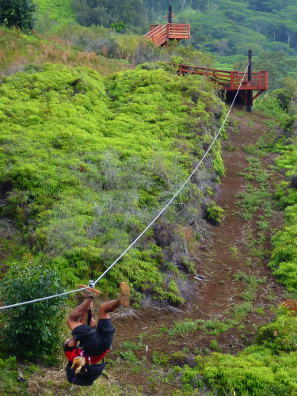 Everyone then gets hooked up to a test line to feel what it’s like to hang from the pully and sit in the harness. 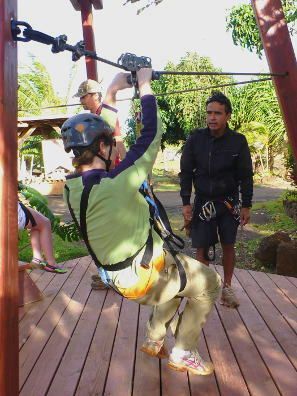 Here one of the guides, Jesse, helps my wife. 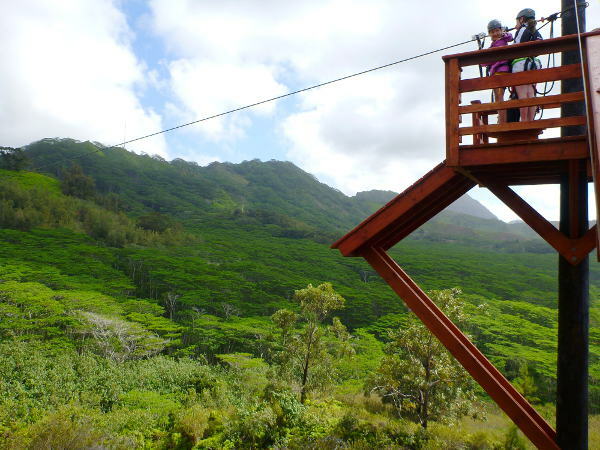 The handles on the pulley are optional, you can use them to “steer” your body, but you don’t need to hang on. 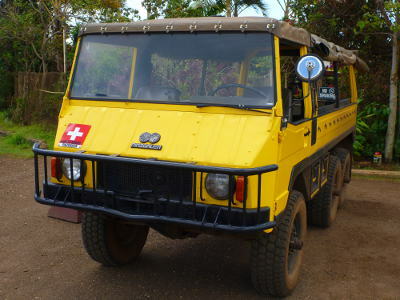 Then we all climb aboard the Pinzgauer 6×6 military transport. These were developed near my wife’s hometown in Austria, and I’ve seen several on Kaua’i. 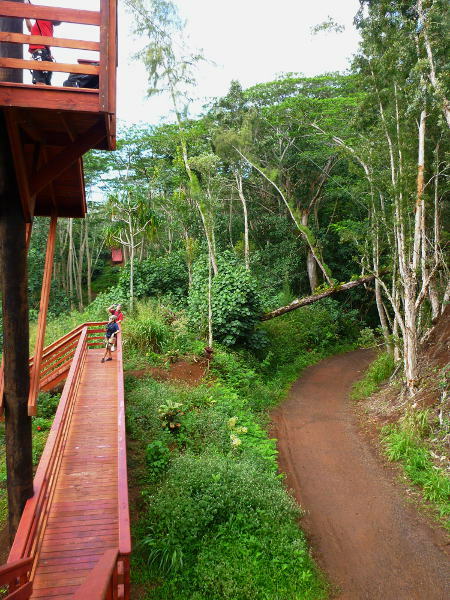 I think Kaua’i Backcountry Adventures uses them to take customers on the dirt roads as well. 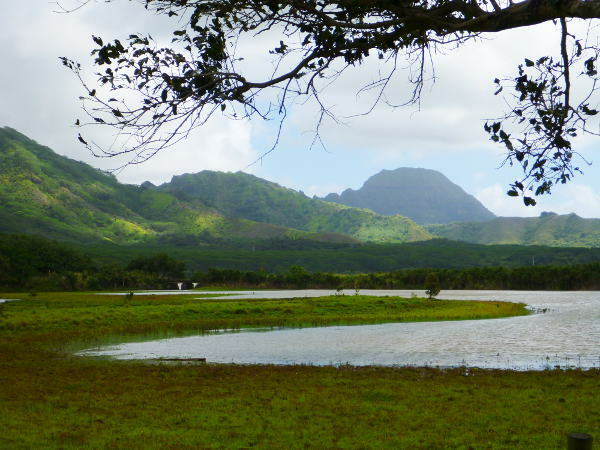 The rough dirt road leads across the former sugar cane fields and into the forest at the foot of the Ha’upu ridge. 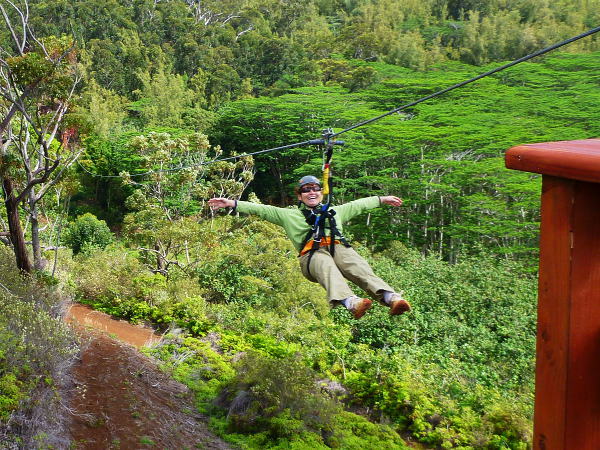 Soon you arrive at the first zipline. 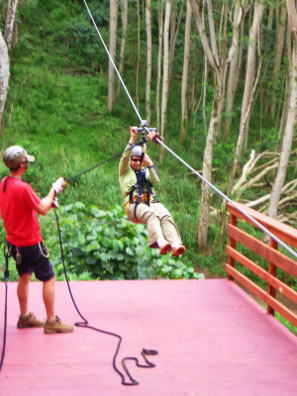 For those that don’t know, a zipline is a cable strung between a higher starting platform and a lower landing platform so that you glide by gravity down the cable as you hang from the pulley. 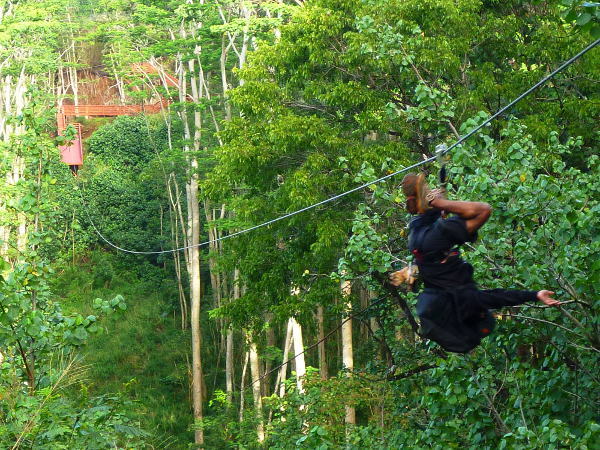 Some ziplines are attached directly to trees, but this forest is mostly fast-growing and brittle Albezia trees. My friend Derek is replacing some of the invasive species with native plants, and then he built all the platforms on erected poles with guy wires solidly anchored in the ground. Part of the fun is climbing up the various ramps and catwalks. 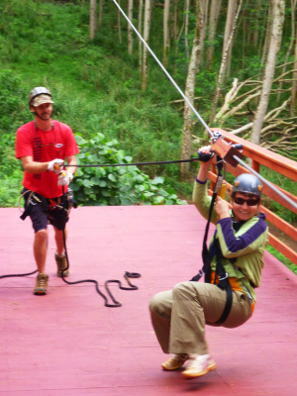 This line is already long enough to pick up some good speed, and in the photo above, you can see the guide holding a line tied to a traveler on the cable that will catch and slow down the rider. 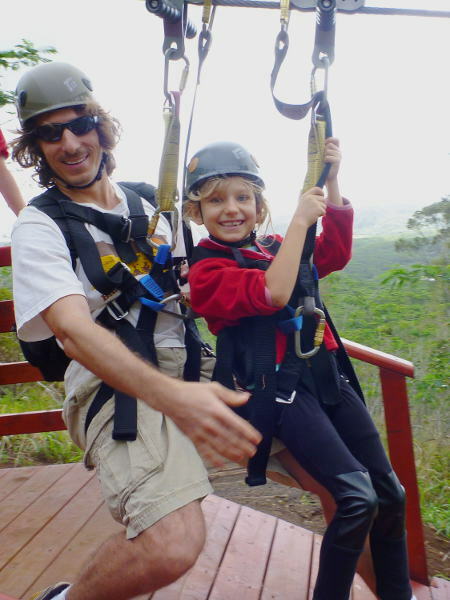 Ziplines are based on physics: adults are heavier relative to their size and build up more momentum to overcome wind resistance. My wife was a bit worried about the landing, either coming in too fast or too slow, but she quickly got the hang of it. Here she’s steering her body straight to reduce wind resistance and keep her speed up. Then the guide slows her down with the braking line, and she lands perfectly to stand up and unclip the pulley from the line. 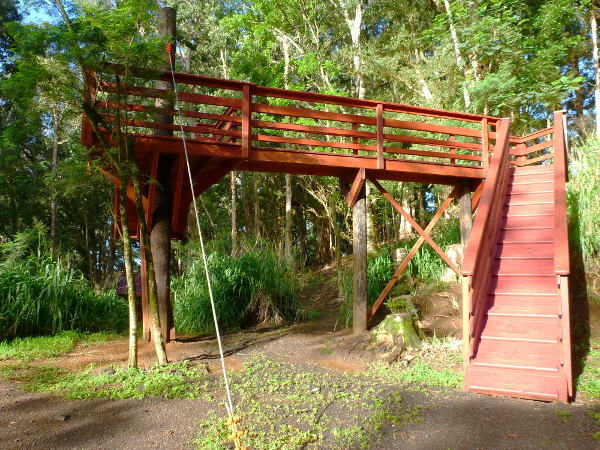 The third line starts from a tall structure and skims a few trees before crossing another small ravine. The road on the right is the same that we drove up, but closer to the mountain. 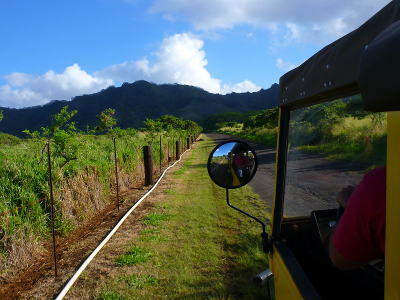 In fact just after the curve in the photo, the road goes through a tunnel to the Lihu’e side of the mountain. 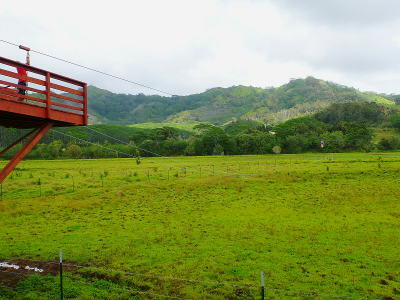 Grove Farm had sugar fields on both sides and needed a shortcut to get the cut cane to the Koloa mill. After a short but steep hike uphill, we get to the start of the 4th line, the longest so far and the 2nd longest of the course. It stretches an impressive 1700 feet (520m) to the next ridge. The guides hand out water bottles and we take a break after the short climb. As with rock climbing, the guide make sure everyone on the exposed platform, including himself, is clipped in to a safety line. 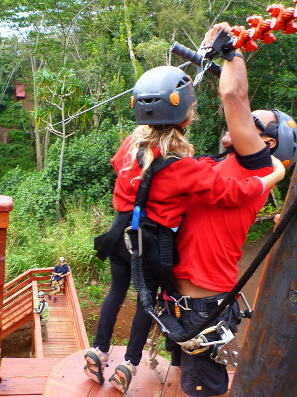 The safety line holds my daughter while the guide puts my pulley on the line behind hers. By this point in the tour, she was excited at every start and really wished she could go by herself. And here we are all clipped in safely and attached together, ready to step off the platform. For every zip, there is one guide at the launch, and one at the landing. But if you’re thinking about these things, how does the first guide to cross slow down, since there is no-one there to catch him? The answer is: the old tennis shoe trick, just like on a bicycle without brakes. According to my camera, this zip is a whopping 48 seconds long. Doing some quick math, that means we average 54 feet per second (16.5m/s), or 37 MPH (59 km/h). That’s why the landing ramp is so long, so you have space to slow down if you come in fast. 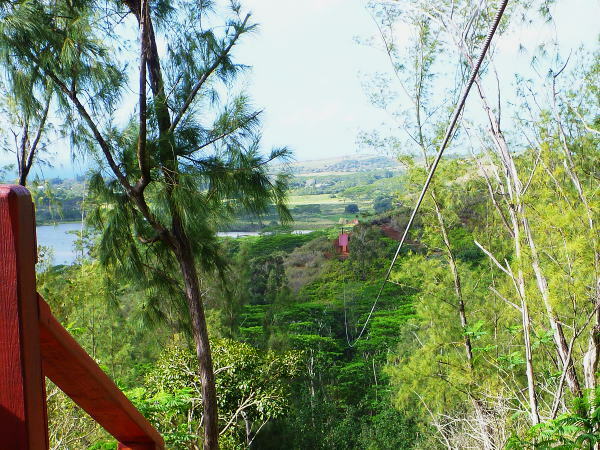 Here’s the view of the landing area, and you can almost see the red starting platform way up the hill. This view was taken from a different angle and shows the length of the line across the swamp. Again, the launch platform is barely visible in the upper-right corner. While we were waiting for the others to arrive, I wandered down by the lake where there are nice views that you don’t see every day with Ha’upu summit and reservoir in front of it. Then we were taken by regular van back to the baseyard to return the gear and chat with the guides. Thanks to their help to make everyone feel safe and comfortable, nobody got scared, and everyone was pumped up from a whole morning of adrenaline. They really love their jobs, and in the end, I really envy them. 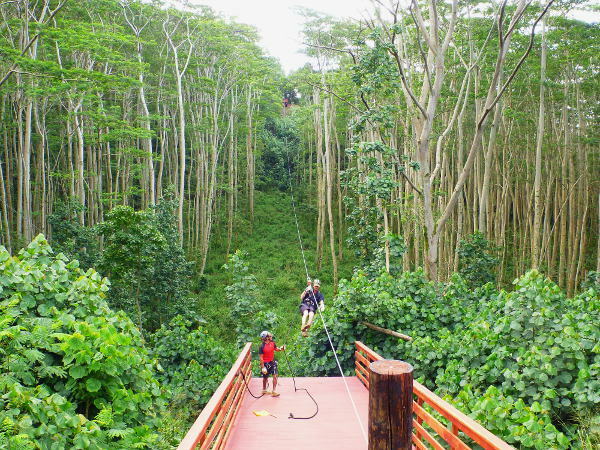 Even before we got back in the car, my daughter started asking: “when can we go zip lining again?” And she hasn’t stopped for the past 2 weeks. No hesitation, no apprehension, she just loved it, and so did we. Let’s see–whose birthday is next, hers or mine? 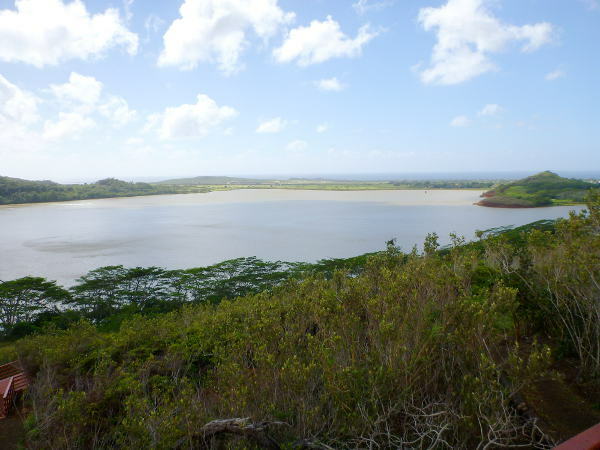 This entry was posted on Sunday, March 17th, 2013 at 8:19 pm and is filed under Reviews, Tourism . You can follow any responses to this entry through the RSS 2.0 feed. You can skip to the end and leave a response. Pinging is currently not allowed. 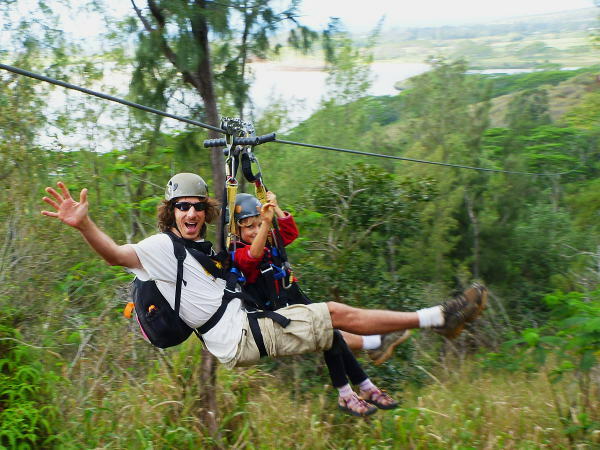 Thank you so much for sharing your first zip line tour! 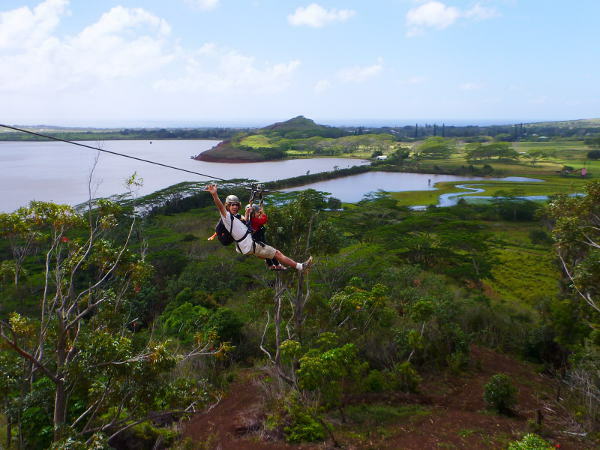 We were in Kauai last November & only had enough time to choose a few things from a list of many fun things to do. 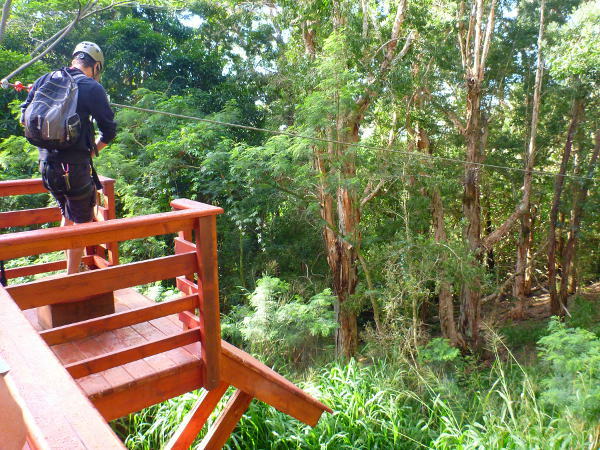 I was a bit apprehensive of the zip line but now we will definitely try it when we return there with our 7 & 10 year old! Tell your daughter thanks for making it look like the ride of a lifetime! Can not wait to go! R755 theme designed by varometro. 31 queries in 0.241 seconds.